For the card, see Soul Fusion (card). Soul Fusion is a Booster Pack in the Yu-Gi-Oh! Official Card Game (OCG) and Yu-Gi-Oh! Trading Card Game (TCG). 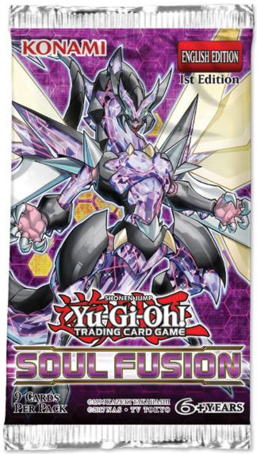 It is the sixth set in the OCG's 10th series, following Cybernetic Horizon. Includes cards used by Yusaku Fujiki, Takeru Homura, and George Gore. The TCG version includes cards used by Declan Akaba and Sora Shiunin. Includes new members and/or support for the "Chaos", "Crusadia", "Cynet", "Fur Hire", "Fusion", "Galaxy", "Galaxy-Eyes", "Gravekeeper's", "Impcantation", "Krawler", "Necrovalley", "Photon", "Sky Striker" and "World Legacy" archetypes. The TCG version includes members/support for the "Aesir", "D/D/D", "Danger! ", "Edge Imp", "Fluffal", "Frightfur", "Melodious", "Noble Knight", "Nordic", "Nordic Alfar" "Predap" and "Predaplant" archetypes. Introduces the "Dinowrestler", "Salamangreat", and "Orcust" archetypes to the OCG/TCG. Introduces the first support for the "Forbidden" and "Thunder Dragon" archetypes to the OCG/TCG.